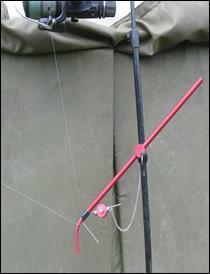 Bankstick attachment with thumbwheel and u-shaped pivot wire with two soft foam beads. 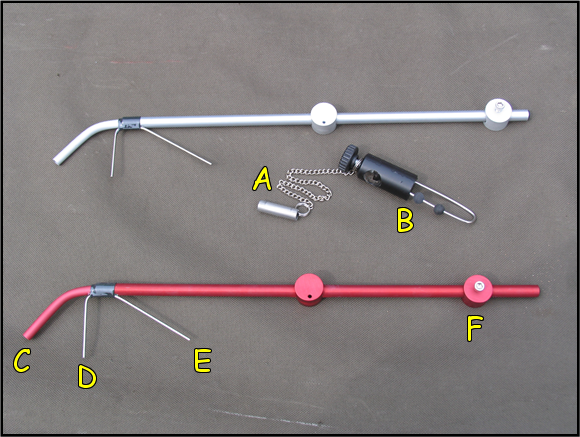 Select the bankstick attachment, and slide it on to the rear bankstick and secure it in position with the thumbwheel. Position the height to allow both ground clearance and overhead clearance (below the reel) for the indicator. Slide the rollover indicator onto the top wire of the two wires on the u-shaped pivot, then secure the indicator into place along the wire between the two supplied soft beads. The bottom wire acts as a backstop or buffer to prevent the rollover spinning all the way round. The u-shaped pivot wire is detachable. Squeeze it together like a safety pin then fit each end of the two wires into the two holes on the end of the bankstick attachment. Push the wires in to the holes to get a secure grip. The line is held between the claw and the line stop in a position below the reel-spool in such a way that the line comes down vertically from the spool. To adjust the weight-load bearing on the claw at the front-end – loosen the thumb-screw, then move the counterbalance along the tube and lock it in place by tightening the thumbscrew. Moving the counterbalance weight towards the rear and away from the front-end claw reduces the loading to give lighter, more sensitive settings. Moving the counterbalance weight towards the front-end claw and away from the rear gradually increases the load. A heavier loading may be required if the current is a greater force. Slide the counterbalance off the main tube and attach it to the weight spacer tube (which is attached to the chain) then secure with the thumbscrew. Slide the weight spacer tube on to the weight arm (the diagonal wire) where it will bear extra weight onto the front claw, which will be enough to hold in most conditions. 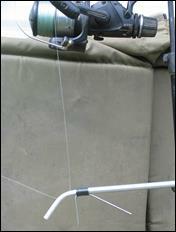 The weight spacer tube & its attached chain are not needed for the lighter settings which will be enough to cope with most small stillwater angling situations. When a run occurs the counterbalance weight and its spacer tube drop off the weight arm and dangle on the attached chain, leaving the indicator free to do its rollover and lift off the mainline. If still further weight is required a lead with a hole through the centre can be loaded onto the weight arm. This will drop off as the indicator lifts when a run occurs. Extra weight can be added until the load is critically balanced to have just enough weight to hold against the tow or current, this will not be too heavy a load that could impede a shy-biting fish. And finally, here is a useful tip to stop the noise driving you crazy in the back of the car.